I’m using the new Profile page!!! It’s fun to play with…. 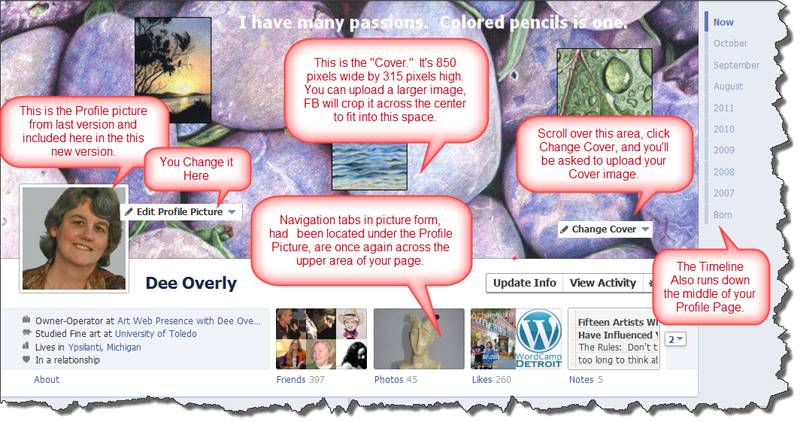 Finally, some individuality is coming back to the Profile pages of Facebook. It’s really quite exciting. Anyway, I’m very excited about. Yes, I know….. more changes. Oh how we humans hate change and grumble at Facebook for constantly making us go through change after change after change. But, really. You’re going to enjoy this one. It’s going to make it fun to cruise around and look at everyone’s Profile pages. Most of the time we never even visit our “friends” Profiles. Why should we, they all look alike. The only difference is that small mug shot over on the left. And maybe once in a while we stop in to check out the picture albums. But all of this can be done from our own Home page, so why take the time to venture out. The Cover is like a large website header. 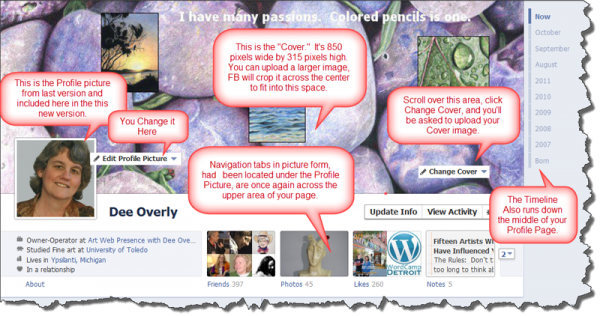 You can upload your favorite picture or create something special that represents who you are. And we can change the Cover whenever we want. Yes, this is going to make cruising FB fun again. When is it coming to everyone. Well….. it was suppose to be the end of Sept, then early in Oct 2011. I don’t know. When it’s ready I guess…. Learn more about the new Profile Timeline.